I am so excited to help continue the blog hop to celebrate the 85th anniversary of Jaftex. If you are a new visitor to my site, welcome, and I hope you come back to visit again soon! 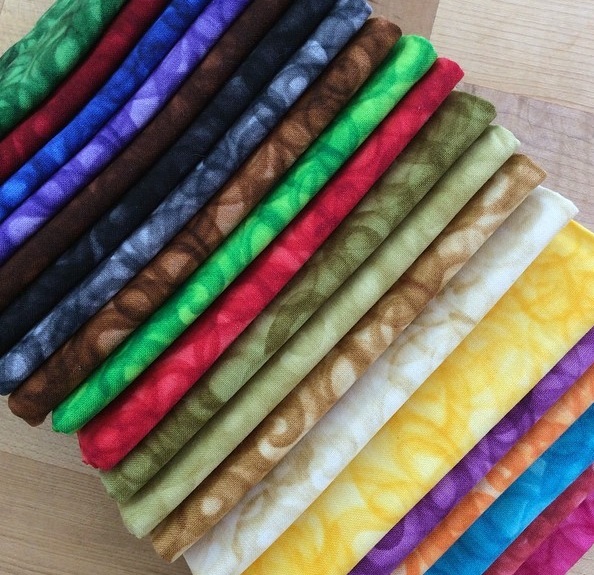 I had the pleasure of receiving a 20-piece fat quarter bundle called Fusion Illusion from Blank Quilting. I played with organizing groups of colors when I received the bundle, and I was strongly pulled to a delicious rainbow grouping of 12 of the 20 fat quarters. 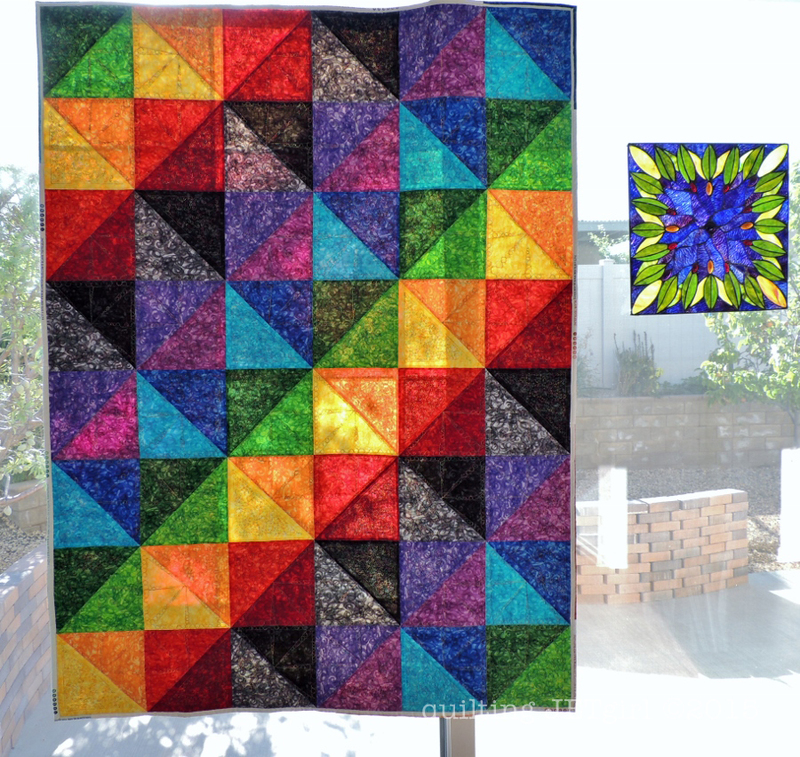 I worked hard to maximize the use of each fat quarter for the quilt design, and I am so happy to get to share my 48-inch by 64-inch quilt, Prismatic Rainbow with you today! 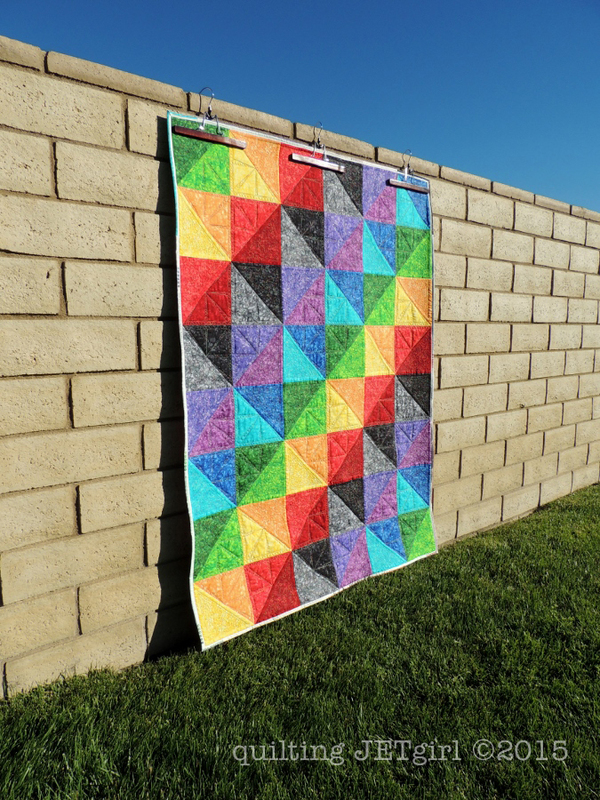 The angled rainbow play of this quilt design reminds me of the prisms I hang in my kitchen window to catch the morning sun and cast rainbows across my home. 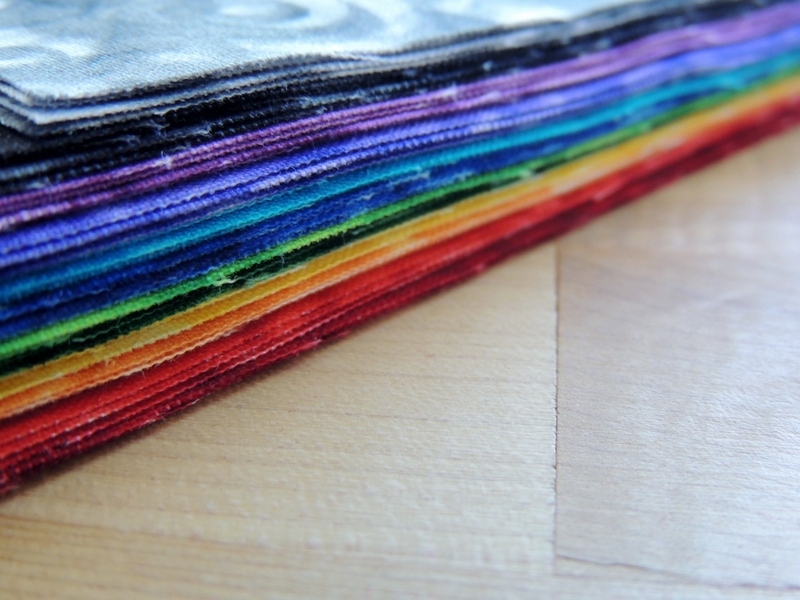 The Prismatic Rainbow quilt was my original inspiration for creating my Selvage Binding tutorial. When preparing to cut the fat quarters for piecing the top, I started by trimming 1.25-inch wide selvage edges off of each of the 12 fat quarters I selected for the quilt top to set aside and save for a special binding. 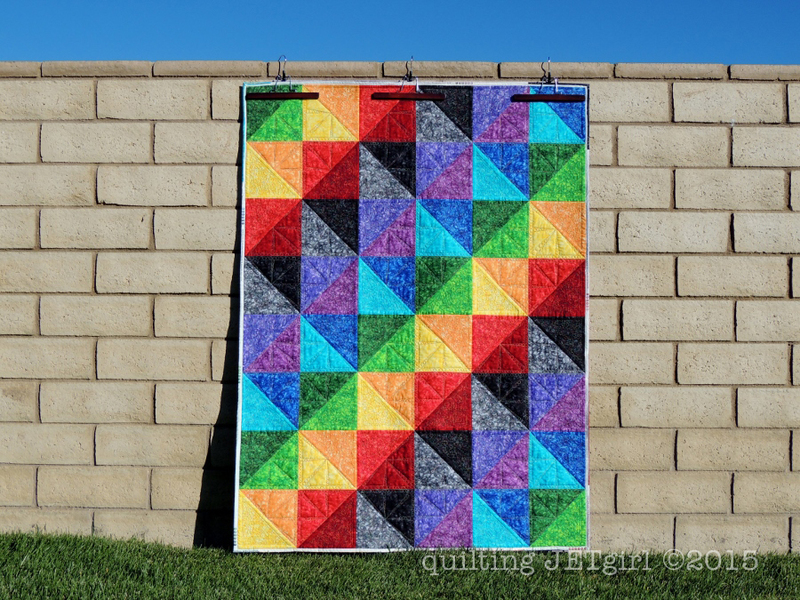 I think the white edge with touches of color are a special frame and finish for this quilt! I tried something new when I started quilting this project; I decided to baste around the quilt edges and sew around each block and triangle first before coming back and filling in the quilting detail. As I was progressing along, I was really concerned about how well I was stitching in the ditch around the blocks, especially along the 45-degree angles. Even with a ruler, the angles were tough, and I was doing my best to keep the quilt super square as I worked my way down. Feeling disappointed with my workmanship, I took a break to flip through one of my favorite books for quilting inspiration, “Shape by Shape” by Angela Walters. As I was looking for inspiration on how I wanted to quilt the triangles, I noticed that Angela also outlines her blocks when she quilts. And you know what? Her stitch in the ditch isn’t 100% perfect either. Seeing those photos of Angela’s work and with her motto, “Better finished than perfect” ringing in my mind, I was excited to get back to quilting! I used the beautiful 50wt Aurifil 3817 variegated thread to compliment the beautiful rainbow jewel tones of the Fusion Illusion fabrics. I wanted the quilting to compliment the design and add another layer of depth as well. 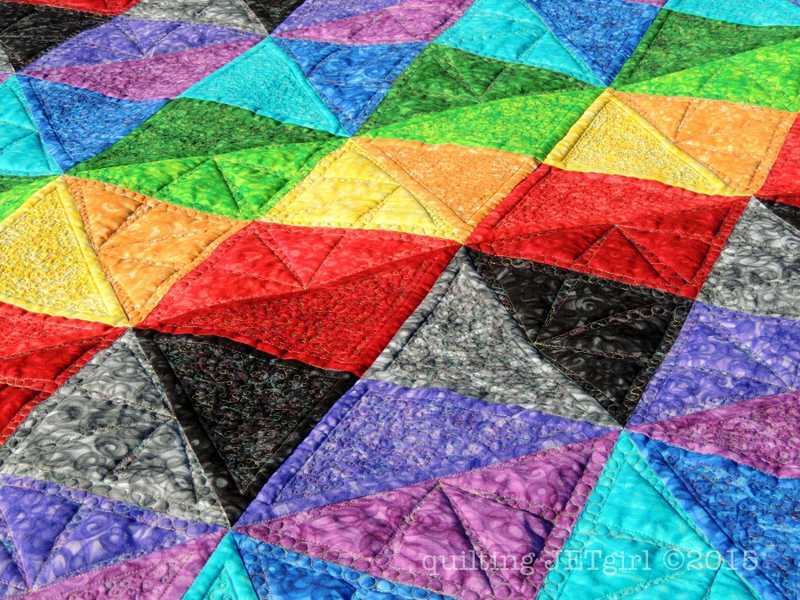 My hope is that the beautiful rainbow colors and arrangement draw you in, and as you get closer, the alternating quilting designs catch your interest and give a depth and almost 3D effect to the design. The 3817 variegated Aurifil thread tones are also the perfect compliment to that desire. I used the remaining 8 fat quarters (plus a few extra fat quarters) to piece together a backing for the quilt. I just loved getting to see Prismatic Rainbows hanging in the sunshine next to my stained glass window overlooking my backyard. ***UPDATE*** The Giveaway is now closed. 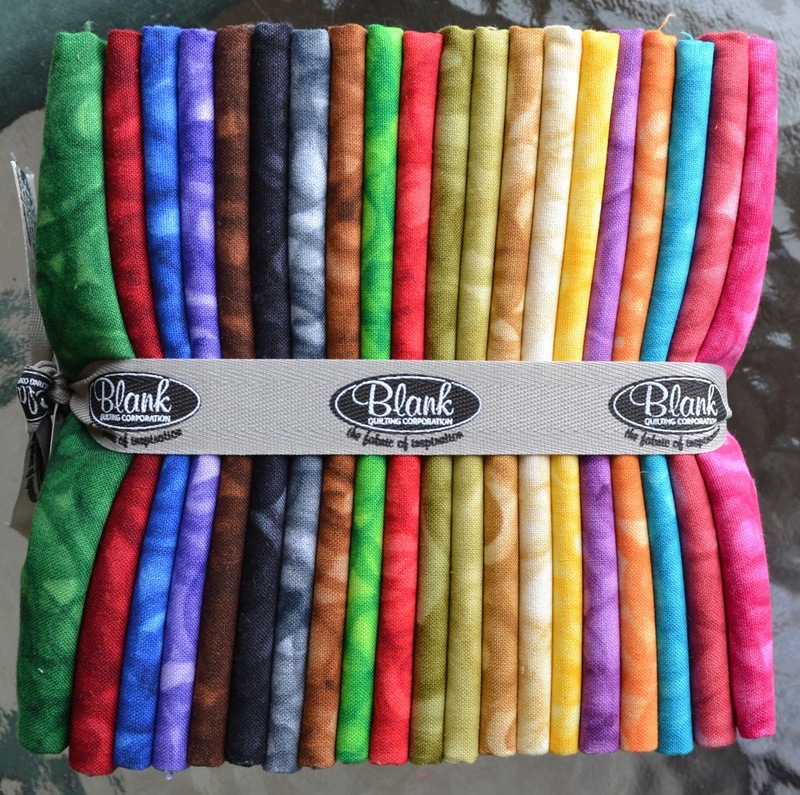 Jaftex / Blank Quilting Corporation generously donated an additional 20-piece Fusion Illusion Fat Quarter Bundle for me to giveaway to a reader of my blog. To enter, simply leave me a comment letting me know how you follow me (email, Bloglovin, Facebook, Instagram, etc.). The giveaway is open to anyone with a domestic U.S. shipping address, and the giveaway will be open until September 19th at 11:59 PM Eastern. I will use a random number generator to pick a winner, and the winner will have 1 week to respond with their U.S. shipping address or I will select a new winner. Good luck! Follow along with the blog hop! There will be fun giveaways along the way, so make sure you visit every day! September 15 – Yvonne @ Quilting Jetgirl <== You are here!! Win Prizes Here: 85th Anniversary Giveaway <== Click to Enter! There are 13 ways to enter! Prizes include a Janome S5 valued at $1500, an Aurifil thread box valued at $300, a Schmetz needle anniversary tin filled with needles valued at $75, fat quarter bundles, and bolts of fabric for your favorite quilt store! 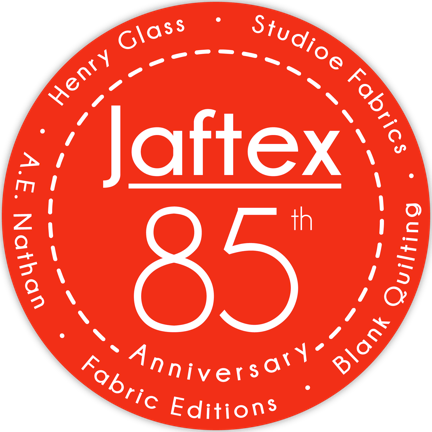 About Jaftex: Jaftex Corp. was founded in the 1930’s when Jacob A. Fortunoff started selling fabric on the streets of New York. At that time, the mainstay of the business was women’s sleepwear and lingerie. In the ’80’s, Jacob’s grandson, Robert, dramatically changed the business of the company. The business focus was transferred to the over the counter quilt industry when Robert purchased companies like A.E. Nathan, Henry Glass, Stylemaker, Chanteclaire, Fabric Editions/Studioe and more recently The Blank Quilting Corp. Robert is now joined by his two sons, Scott and Greg. Scott currently is the President of Studioe Fabrics, The Blank Quilting Corp. & A.E. Nathan Co., Inc. Greg just joined the business in late 2014 and has successfully spearheaded the company’s foray in to precut fabrics among other contributions. 103. I love how you played with the quilting. i follow on feedly! 104. What a beautiful rainbow quilt! 105. I love your Prismatic Rainbow quilt. I have been following your blog with bloglovin. 106. I follow by email! Love the colors!! 107. I’ll follow you on Bloglovin! Love the fusions! They have the prettiest rainbow palettes! 108. Gorgeous quilt! Love those saturated colors! I follow you on Bloglovin. 109. I just signed up to follow you on bloglovin. Looking forward to the posts! 110. This quilt is very impressive to me because when I first saw your photo of the fabric I really didn’t like it and couldn’t imagine liking a quilt made from that selection, but actually your quilt is stunning! And lovely to see even more rainbows in your life! 111. This is a really beautiful quilt Yvonne. The red and orange intersections are particularly striking . I love the little circles in the quilting. 112. Fantastic quilt! I follow via email. 113. This is really pretty Yvonne! 114. I follow you on Bloglovin’. Love your quilt. 115. Love love your quilt and love these fabrics too! 116. Stunning. The way you know your way around color is a gift and skill! I am following via email and bloglovin’. I am inspired by your use of color….I love it and wish we could quilt along so I can learn how to use colors the way you do in your quilts! 117. Love the way you used this great fabric line. 118. Following via Instagram! @hopefulthreads Thanks so much! 121. You are really convincing me that a rainbow quilt needs to be added to my to-do list. Love the layout and the quilting choices. And it’s always good to remember Angela’s words of wisdom. Need to remind myself of that as well. 123. I am a new follower by email. Love your quilt! 124. I follow on instagram! 125. i follow you on word press. couldn’t see how to follow by email….. prefer that. 126. Your quilt is beautiful. I love all the color in it. 127. The colors are very joyful. 128. Your quilt is gorgeous. I follow you via Bloglovin. Thank you for the generous giveaway and the chance to win. 129. 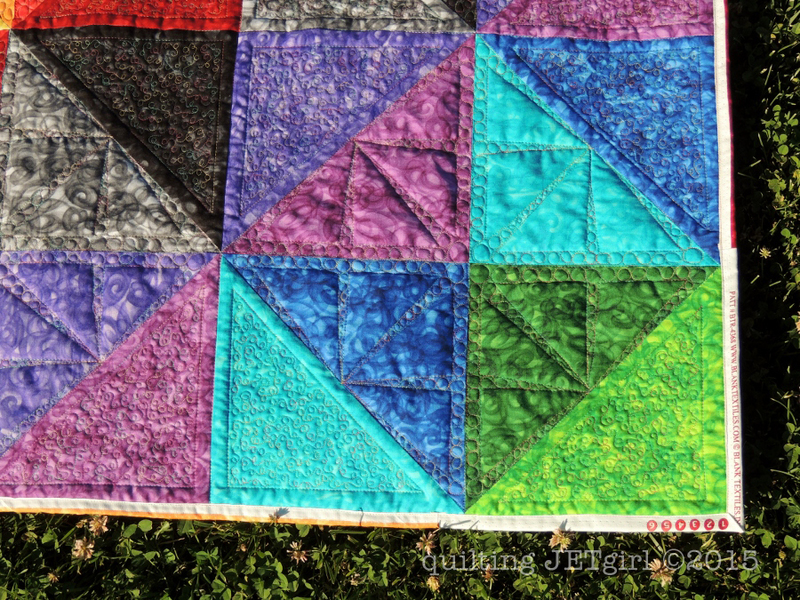 Love the bright colors and your quilting, I also need Angela’s reminder that finished is better than perfect! LOVE the binding made from the selvages! !